Scampi's Fish and Chip Shop - an authentic British chippy! Situated at Compostela Beach, Los Cristianos, Scampi's is an honest-to-goodness fish and chip shop! Yes, amongst the sea, sun, sand and sangria, you'll find a chippy! It's the genuine article, too, with all the usual stuff: fish and chips, pies, mushy peas, sausages, gravy, as well as a few extra more exotic items (because, let's face it, it is Tenerife we're in). They have a take-away counter, just like a regular British chippy ("would you like salt and vinegar? ", etc). But, as well as takeaway, it's possible to have a sit down meal in the restaurant section, too. And yes, you can have a few rounds of bread and butter and a mug of tea if you want. 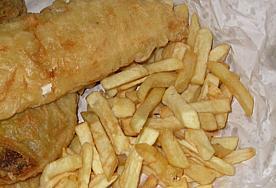 So, when you're tired of carne con papas and fancy something traditionally British, head for the chippy! 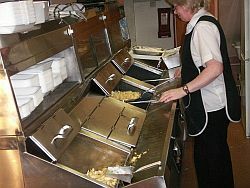 Scampis have been established at their present location since the late 1990s and, if you're a family, you can get your offspring kids' meals, such as fish fingers, fishcakes, chicken nuggests or sausages. If you want something a little bit more upmarket, there's sirloin steak on offer! Scampi's is also licenced to serve alcohol, with a pint of lager, for instance, being a mere two euros. There is also a selection of meal deals, which you'll need to check when you visit. The eat-in part of the venue can get very busy, so, if you want to enjoy a sit-down meal, be prepared for a wait until a table becomes free, unless you book in advance. To find Scampi's, begin at the big roundabout you come to from the TF-1 motorway turnoff for Los Cristianos. Take the sign for Las Americas (first exit), which will put you on a dual carriageway. When you see a filter lane for a left turn, get into it. Follow the road you end up on, which will bring you to a roundabout. Take the first exit. This road will eventually have an acute left-hand bend, after which it drops down to another roundabout. In the past, I've usually parked on this road and walked the rest of the way. Leading off, directly opposite from this roundabout, is a pedestrian walkway, leading to the beach. Go along there and Scampi's will be on your right.